While traditional tikanga Māori (customary law) is a unique consideration for these Māori entities they are often highly politicised; sometimes subjected to restrictive legislation; often aspire to quadruple bottom lines, and usually include long term asset ownership and tribal regeneration strategies. There has been an increase in the number of Māori entities with substantial assets contributing to a growing Māori economy, and this begs the question of what are the most effective Māori governance models? 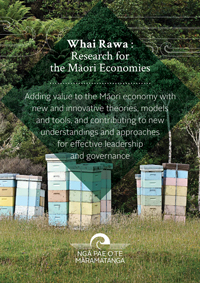 Despite many opinions and inputs into how Māori assets can be better utilised through more effective governance models, a new approach to Māori governance research is required to appropriately address Māori values, institutions and aspirations in 21st century Aotearoa New Zealand. This project investigates these issues and explores how governance methods might better incorporate traditional Māori values. Develop and reaffirm “new” knowledge and transformations resulting from innovative cross-cultural engagement during the Treaty of Waitangi settlement process. Examine aspects of intergenerational wealth and explore the task of modernising Māori/tribal governance with a comparative study of such structures in international Indigenous contexts. Develop appropriate and sustainable Māori governance models that embrace and enhance the economic performance of Māori communities and maintain consistency with mātauranga and tikanga Māori. Promote the uptake of such models – where the governance of a Māori collective or community of interest makes a positive difference in the actual lives and wellbeing of that Māori community.